Making your workplace as green as possible isn't just good for your planet. Going green can reduce costs, improve employee morale and boost the public perception of your company. Making small changes to your workplace can make a big impact overall. Read on to discover ways that you can create a more eco-friendly work environment. Living plants improve indoor air quality by taking in carbon dioxide and releasing oxygen. Adding a few to all of the main areas of your office can help everyone breathe a little easier. Plus, plants help to make offices feel more inviting and bring a bit of the outdoors indoors. When you're ready to replace your office equipment, look for models that are Energy Star certified. Printers, monitors, computers, copiers and other office equipment with this certification meets EPA standards for energy efficiency, meaning they are good for the planet and can reduce your utility costs. Take a moment to consider how well you're using the natural light in your office. Remove heavy blinds that prevent light from entering and consider reorganizing your office to put work areas near the windows. 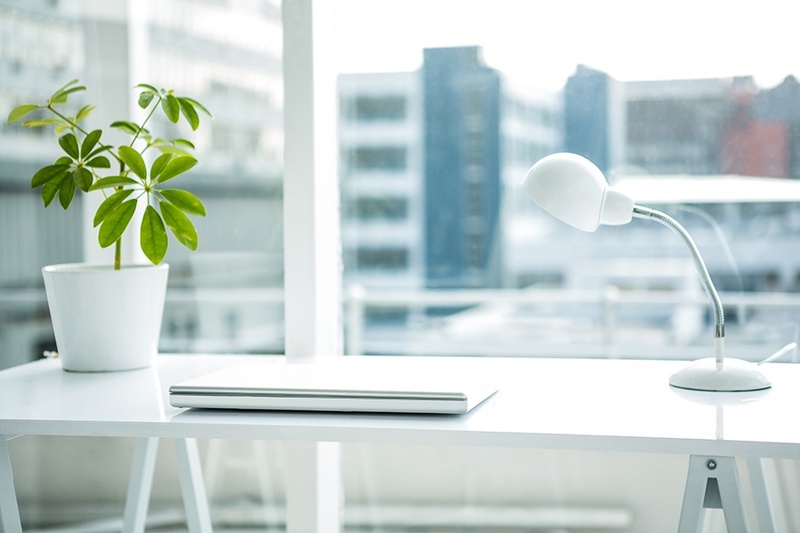 Providing natural light can reduce eyestrain and improve employee morale. Find a comfortable level for the thermostat in your office and lock the box to prevent tampering. You can also switch to a smart system that automatically adjusts performance during off hours. These changes can help to maintain optimal working conditions and reduce energy costs. Making the switch to LED lighting can save your company money over time. Not only do LED fixtures consume less energy, but they also give off less heat, helping to keep work spaces more comfortable. Plus, LED lights can burn for thousands of hours, cutting down on the need for frequent bulb replacements. When employees use public transportation, car pool and bike to work, your company's overall eco footprint shrinks. Take steps to incentivize using these methods of transportation. You could give priority parking to car poolers or help to offset the costs of bus or subway fares. Make sure that there are racks outside the building or inside your office to accommodate bikes. Paper consumes large amounts of water as well as contributing to deforestation. Switching to paperless record keeping and documentation can have a big impact on the planet and save you money in supplies over time. Plus, paperless systems tend to streamline processes, which can increase productivity. At the end of the day, have employees shutdown their computers, turn off all office equipment and switch off the lights. Doing so will cut down on energy consumption and decrease your utility costs. Come up with green goals for your office and then issue a challenge to the various departments. Whoever is able to best comply with the new guidelines can receive some sort of prize like a catered lunch or gift cards.